In September 1919 the Newcastle Morning Herald & Miners’ Advocate (NMH) reported the recent return from active service of Matron Ida Greaves RRC. [i] Ida received an enthusiastic welcome at Newcastle Station from a large gathering of relatives and friends. Of all the women from the Hunter region who are known to have served as military nurses in the First World War Ida was the only one to have been in uniform throughout the War, having been appointed Matron of a field hospital in August 1914. 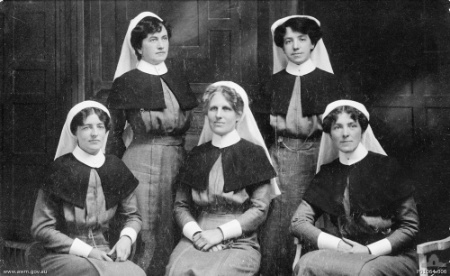 [ii] By the end of 1914 a handful had enlisted and seventeen more followed in 1915 but the greatest contribution by Hunter region nurses was in the later years of the war and the first years of the peace that followed, with fifty-four enlisted, at sea or on duty by September 1917. 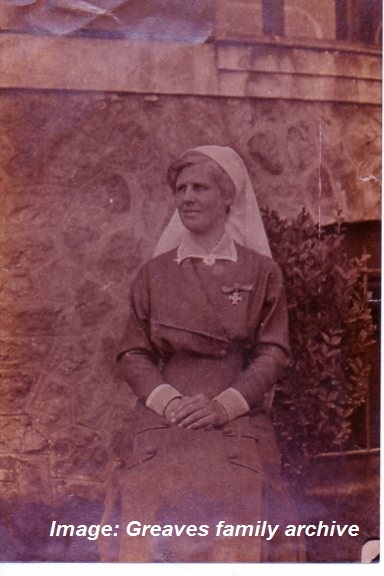 Matron Ida Greaves wearing the Royal Red Cross. Possibly taken following her investiture in 1915. Image courtesy Greaves family archive. Matron Ida Greaves and another Australian woman Nora Kathleen Fletcher who was Principal Matron of British Red Cross nurses in France were the first Australian women in the First World War to have been awarded the Royal Red Cross, an award instituted by Queen Victoria for exceptional conduct in military nursing. Ida Greaves came from a large Newcastle family that supplied three probationary nurses to Newcastle Hospital at the turn of the twentieth century. She graduated from Newcastle Hospital in 1904. [iii] Nurses often moved on from their training institution once they had graduated. There were opportunities to travel, to take up more senior positions in other hospitals or perhaps better pay and conditions in private nursing. Ida Greaves had been nursing in England when war was declared and was in the right place at the right time, at the heart of the British Empire in London. In August 1914 Ida’s story begins not with the Australian Army Nursing Service but with the Australian Voluntary Hospital (AVH), an independent medical unit that was the brainchild of Lady Rachel Dudley, the wife of a former Governor General of Australia. [iv] She remained interested in Australia and Australians after her return to England and kept in contact with Australians living there. In August 1914 she offered to establish a 200-bed field hospital that would go to France. It would be staffed by Australians and as far as possible funded by Australian donations. The offer was accepted by the authorities and within a month of the outbreak of war the AVH had been formed and had arrived in northern France. Members of Lady Rachel Dudley’s Australian Voluntary Hospital, Southampton 27 August 1914, before embarkation for France. Matron Ida Greaves seated at centre. Matron Ida Greaves had her photograph taken on 27 August 1914 on the eve of embarking at Southampton for northern France as the Matron of the AVH. She wears uniform dress, cape, starched white veil, cuffs and collar and is the very picture of a hospital matron. The face is attractive, with strong features, the long fair hair parted in the middle and swept back over the ears in two smooth wings as was the fashion of the day. She sits straight backed as the focus of a small group of similarly dressed women who variously sit or stand around her. [vii] At thirty-nine years old Ida is a commanding presence, a nurse qualified to Australasian Trained Nurses’ Association standards and with ten years’ experience. There was a considerable degree of courage involved in taking on this assignment at the time. When Matron Greaves and her nurses embarked from Southampton in late August the German army was continuing its advance into northern France. The French and British armies were in retreat. In the earliest days the AVH had to move on several occasions to remain safe. 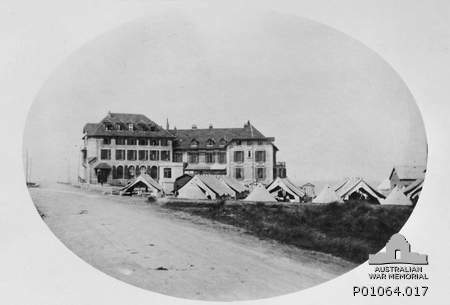 [viii] Subsequently the battle front consolidated into the system of more or less permanent trenches that endured largely unchanged until March 1918, and the hospital took up its permanent position at in the Hotel du Golf in Wimereux.